Before Sweet Pea was born I really wanted to get busy and make a few freezer meals because I knew I would have little time to cook. Of coarse I procrastinated, and now I've found myself deep in a box of Peanut Butter Puffins Cereal wishing I had prepared better for this moment. Trust me, those puffins aren't cheap and 1 box only last like...and hour. Sadly we can't live off cereal, which I could totally argue. (That and a box of chocolates and a bottle of ketchup are all I would need to survive. )..Which is why I've tried hard to prep a few things here and there and throw in the freezer for days of desperation. What is a day of desperation you might ask? For starters I try to cut, chop, wash, store, etc. all the produce and snacks after I go grocery shopping so that healthy food is ready and available to desperate times. This food prep takes some time, and I usually do it at night when the hubs is home. I will even cut veggies that I am going to use for dinner days later, that way it's ready and cut when it comes time to cooking. This week I'm going to share with you two freezer foods I made, the first being Pesto! I love Pesto! It's great for sauces, dressings, pastas, pizzas, sandwiches, etc. Place pesto in ice cube trays or container and drizzle a little extra olive oil on top. Along with that pesto, I decided to add it onto some freezer breakfast burritos. These are super quick and easy grab and go breakfast for someone like a nursing mama or a hubby quickly on his way to work! Take a whole wheat tortilla and spread about a tsp. of pesto on it. Add a spoonful of veggies. 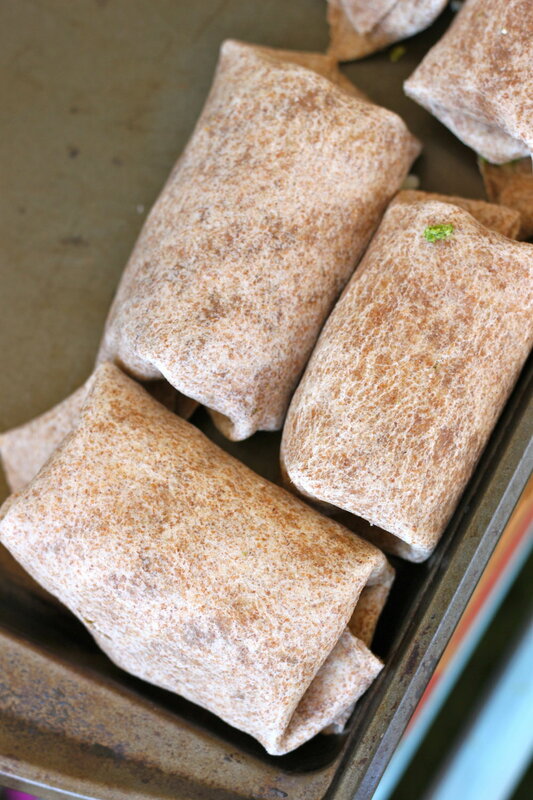 Roll the burritos in plastic wrap and store in a plastic bag or container in freezer. To reheat, remove from plastic and warm for about 1-1 1/2 min. in microwave. Top these bad boys with fresh guacamole, salsa, or better yet...Ketchup!